November, 2013 | Rooflines East Inc. Above is a recent project we have completed in Georgetown, Ontario. This project was a re-roof in which we removed the old shingles and replaced them with GAF Camelot designer shingles. 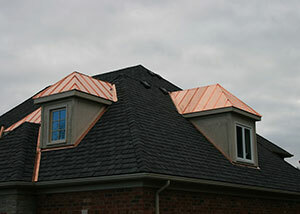 We also installed three custom made 16oz standing seam copper roofs.